Decide the fate of the Marvel Universe over a game of chess with the Marvel Chess Collection and this #42 Marvel X-Men Juggernaut Black Rook Chess Piece with Magazine! The Marvel Chess Collection offers the comic fan and chess lover alike the chance to collect a unique chess set featuring some of the greatest and most loved Marvel characters. The Marvel Chess Collection consists of the greatest heroes and villains from across the Marvel Universe. Will Spider-Man survive against Venom? Can Captain America overcome the villainous Red Skull? Or will the forces of evil defeat the assembled heroes? With the Marvel Chess Collection the battle is in your hands! 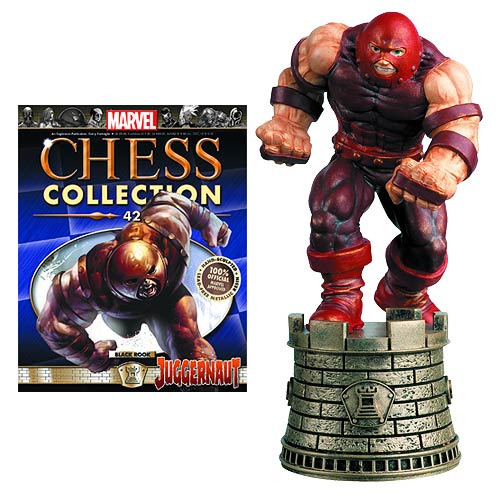 The Marvel X-Men Juggernaut Black Rook Chess Piece with Magazine measures 4-inches tall. Ages 14 and up.